‘Reinventing the Great British Holiday’ was the opening brief to this project involving the construction of 117 two, three and four bedroom chalets. The project saw us working closely with the Butlin’s operations and brand teams alongside main contractors McGoff & Byrne and Allison Pike Architects, to form the brand-new West Lakes Chalet Village, set within the Butlin’s Minehead holiday resort. The project involved the design and master planning of new accommodation, interior design and landscaping works, including the construction of two man-made lakes. Initially a proportion of old accommodation was demolished to make way for the new village. 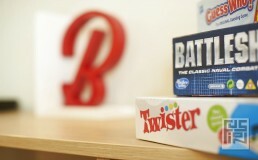 The project aims to support a 21st century Butlin’s experience, targeted at families searching for high-quality seaside accommodation in a spacious and peaceful setting, with the added benefit of the broad range of inclusive entertainment and activities available only a five- minute stroll away on resort. Our design provides a scheme that celebrates the rich history and heritage of the iconic Butlin’s brand, whilst allowing for modern family living. We worked closely with the team to understand the story of Butlin’s and its founder Sir Billy Butlin. The values he lived by went on to revolutionise British seaside holidays. It was his genuine true intent to delight that we wanted to reinterpret within our design. 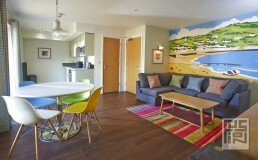 The new chalets comprise of fitted and loose furniture with a modern open plan living and dining space as the focus. Delivered on a strict budget, the bedrooms contain generous kingsize beds complete with Butlin’s branded mattresses and bespoke designed under-bed storage facilities. A bespoke curtain fabric, designed and manufactured by Skopos, can be found in the bedrooms boasting branded yacht symbols, as do the quilts and cushions. 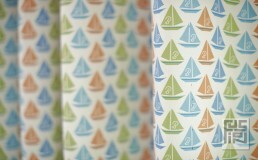 The design of these has taken inspiration from the original sail boat designs of the Butlin’s 1950’s heyday. The scheme is colourful and fun, inspiring families to come together and enjoy their holiday.